NBC News’ Katy Tur reports from the banks of the Oswego River. >>> now to upstate new york we go, on the banks of the oswego river where they are feeling the effects of that cold tonight. katy tur is there for us. good evening. >> reporter: it's also very cold up here, brian, 7 degrees, negative 13 with the windchill. the wind has really been the story out here. 35 to 40 mile an hour wind gusts, all day long coming off of lake ontario , just to the right of me. one man described it as blowing like the devil out here. it's not snowing in oswego right now, but just a little to our north it is, that's where they're getting the heaviest lake effect snow bands. we tried to get up there a little earlier today, but we were not able to do so. we were met by a whiteout on the roads, zero visibility and a block that wouldn't allow us to go through. it turned around. 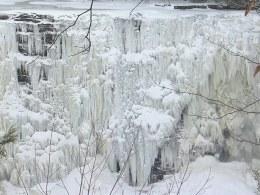 it's no secret it's cold out here, and it's so cold you can take a look at this video right here, this is the salmon river falls. all but a trickle of water and it is completely frozen over. just a solid block of ice. back out here live, no accumulation on the ground out here, even though it has been snowing, because the winds are just too strong, the snow has not been able to even hit the ground. brian?